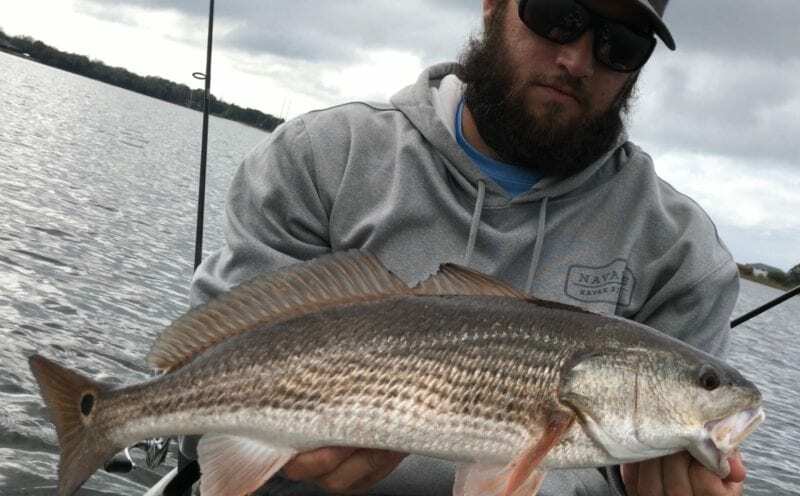 Cold front after cold front has pounded the South Eastern United States over the last two months but it hasn’t slowed the fishing down in Northwest Florida. 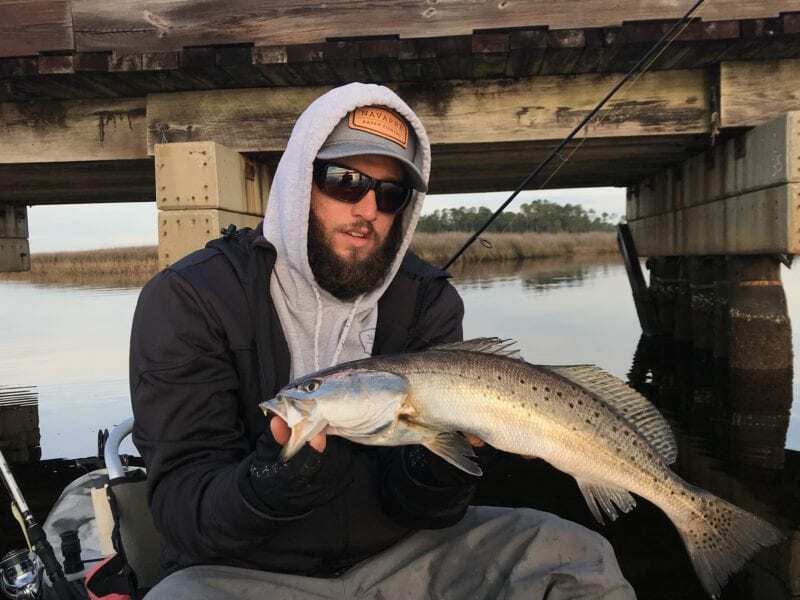 Speckled Trout, Hybrid Bass, and Redfish have been abundant throughout the upper bays and river systems. The winter patterns are in full swing and the Trout fishing is at it’s best. Continue reading “Kayak Fishing in February” and let us help you catch more fish. The water temperatures are in the 40’s and the Speckled Trout are highly concentrated. The fish are in predictable areas and have been feeding rather aggressively. Correctly mimicking the forage species will go a long ways towards ensuring a successful outing. A MirroLure MR17 is one of the best winter time Trout baits and always get the job done. If you’re having trouble catching fish, continue moving until you find bait. Once you find the bait, slow down and thoroughly fish the area. If you catch a fish, cast right back to where you hooked the first fish. 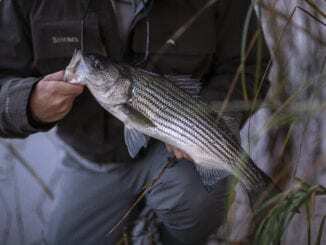 The fish are often stacked on top of each other and the perfect cast makes a huge difference. Make sure you are presenting the lure with the current! 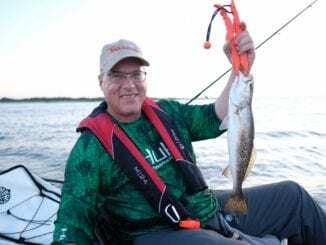 Large Trout are more likely to eat baits with a larger profile and we like to target them using large swim baits like the Jackall Rhythm Wave. 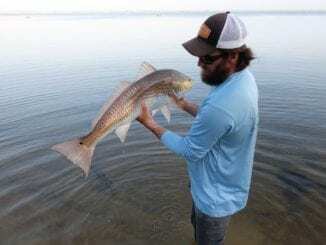 During the winter months, Redfish are abundant in every body of water. The Santa Rosa Sound is crystal clear the coldest parts of the year. Sight fishing them can be a bit challenging this time of the year but is an absolute blast! The clear water makes locating the fish easy, unfortunately it also makes them skittish. Targeting them in the upper bays is often the easiest route. The water is warmer and the Redfish are usually mixed into schools of Mullet. They are still feeding heavily on crustaceans and a well placed soft plastic will get the job done. 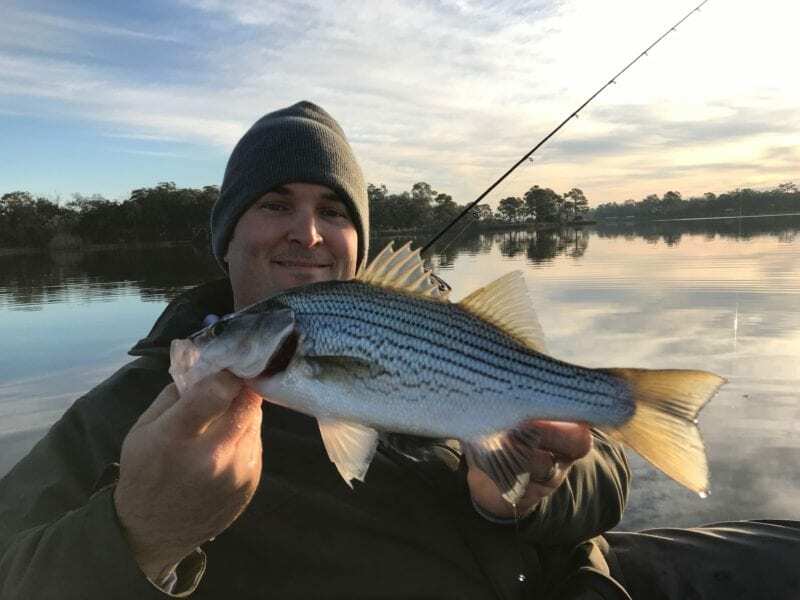 The coldest months of the year provide the best opportunity to chase Hybrid Bass in Northwest Florida. Hybrid Bass make their way down the Escambia, Blackwater, and Yellow River as the water temperatures decline. Hybrid Bass have fairly small mouths and actively chase small minnows. Crankbaits, white bucktail jigs, and silver spoons are commonly used to chase these fish throughout the river systems. Staying warm is the most important aspect of fishing this time of year. The temperatures will remain low throughout the month, do not be afraid to fish during the middle of the day. Unlike the months prior, the best times to fish in February are often during the warmest parts of the day. I prefer to fish in the evening whenever possible! The sun will warm the flats in the evenings and the fish will find the warmest water. If you find a school of quality fish and they refuse to eat, don’t feel bad. They are just trying to stay warm and are awesome watch. Set the fishing pole down and enjoy the view. There’s more to fishing than catching and this is the best time of the year to take it all in!